A German Shepherd, who nearly froze to death in Kansas City, was saved from the cold weather on Sunday. 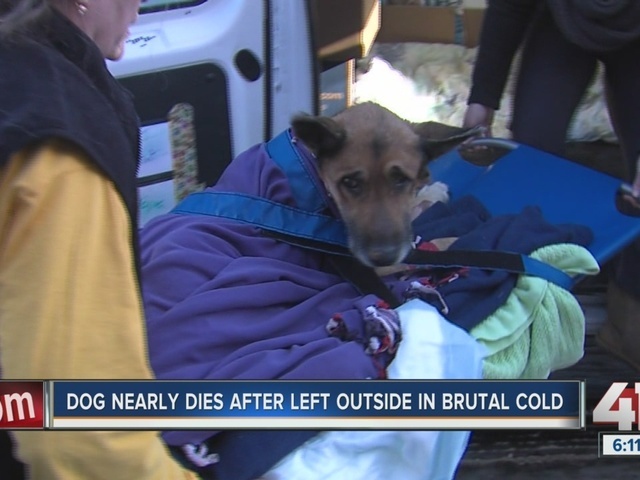 According to the Missouri German Shepherd Rescue, the dog was brought into the Kansas City Pet Project on Sunday frozen, starving, unable to walk and in a comatose state. The person who brought the German Shepherd in told the KC Pet Project various stories about the dog. First he notified KC Pet Project workers the dog was a stray, but then said the dog had been missing for a month. Then Missouri German Shepard Rescue said he admitted that the dog was his and he had been chained up in the backyard his entire life. The dog was signed over by the owner and taken to the Blue Pearl Emergency Vet and transferred to the Plaza Animal Clinic for ongoing treatment and care. The Missouri German Shepherd Rescue said the dog’s eye might have to be removed. They also said he has one severely injured back leg, little body fat and cannot stand on his back legs. His nails have overgrown and the Missouri German Shepherd Rescue says he has no front teeth because of constant chewing on his chain. The Missouri German Shepherd Rescue has renamed the dog Caesar, because they said they know he will conquer his conditions.